Tim and I thought it was a bright idea to try and combat the time change before we go to Paris- since Portland to Paris is about a 9 hour time change. We go to bed at 9 pm our time and wake up 3 am and our flight is at 8 am and we arrive in Paris the following day at 7 am Paris time. We would only sleep part of the way and wake up bright and fresh in Paris. Well I ended up only getting about 45 minutes of sleep and Tim got maybe an hour… all I could think about was sleep. Tim kept telling me that is like pulling an all night-er in college. Since when was pulling an all night-er in college fun? To put it simply- Paris was beautiful. 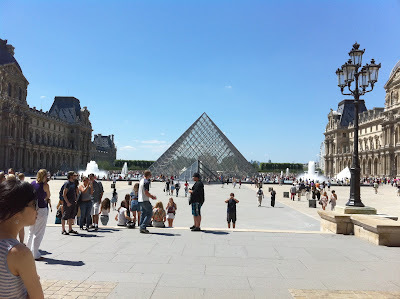 We went to the Louvre and it was free day which meant the museum was packed. 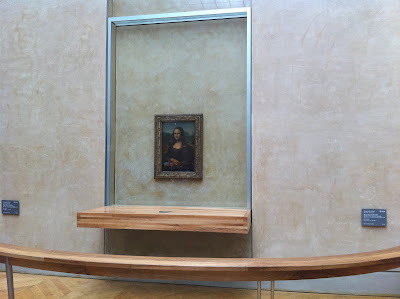 We made a bee line for the Mona Lisa- which was surrounded by about 4 feet of on lookers. Her curious smile and her eyes staring directly at me- everything I had hoped. I can honestly say the painting was more moving in person, and I was a little skeptical. Recommendations: Take a nap and everyone speaks in English.